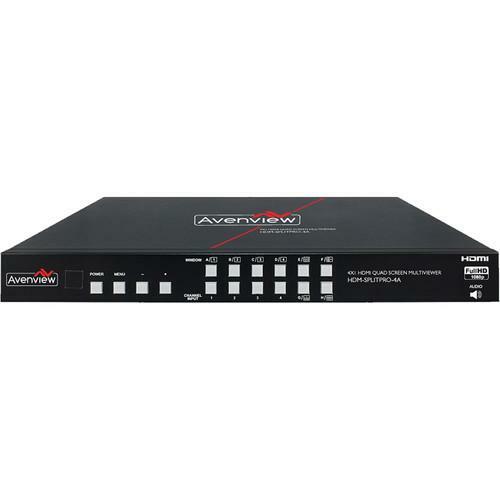 We recommend checking out our discussion threads on the Avenview 4 x 1 HDMI Quad MultiViewer HDM-SPLITPRO-4A, which address similar problems with connecting and setting up Multi Viewer Processors Avenview. The user manual for the Avenview 4 x 1 HDMI Quad MultiViewer HDM-SPLITPRO-4A provides necessary instructions for the proper use of the product A/V Presentation - Signal Processing & Distribution - Multi Viewer Processors. The 4 x 1 HDMI Quad MultiViewer with Rotation, Chromakey, and Audio from Avenview can be used for multiview (quadview), switching, and compositing. If features four HDMI inputs, and allows you to zoom in, rotate, and arrange all four sources in custom configuration within a single SD or HD frame. The multiview feature can be used in surveillance to monitor up to four cameras on one screen, as an accessory to a live video switcher that doesn't provide built-in multiview, or for creative digital signage applications. It can also act as a seamless switcher. Seamless means the image fades to black, and then fades back in during the transition for source A to source B. Finally, the device can be used for compositing and chroma key. In chroma key mode only two of the four inputs will be used, one serves as the foreground element and one the background. The program video feed is output over a single HDMI port that, in multiview mode, combines all four input sources into a single feed. To configure the multiview arrangement or manually switch between inputs there is an OSD (on screen display) that is accessible using front panel buttons, an Ethernet port for Telnet control, and an RS-232 port. If you own a Avenview multi viewer processors and have a user manual in electronic form, you can upload it to this website using the link on the right side of the screen. Box Dimensions (LxWxH) 22.7 x 16.3 x 5.6"
The user manual for the Avenview 4 x 1 HDMI Quad MultiViewer HDM-SPLITPRO-4A can be downloaded in .pdf format if it did not come with your new multi viewer processors, although the seller is required to supply one. It is also quite common that customers throw out the user manual with the box, or put the CD away somewhere and then can’t find it. That’s why we and other Avenview users keep a unique electronic library for Avenview multi viewer processorss, where you can use our link to download the user manual for the Avenview 4 x 1 HDMI Quad MultiViewer HDM-SPLITPRO-4A. The user manual lists all of the functions of the Avenview 4 x 1 HDMI Quad MultiViewer HDM-SPLITPRO-4A, all the basic and advanced features and tells you how to use the multi viewer processors. The manual also provides troubleshooting for common problems. Even greater detail is provided by the service manual, which is not typically shipped with the product, but which can often be downloaded from Avenview service. If you want to help expand our database, you can upload a link to this website to download a user manual or service manual, ideally in .pdf format. These pages are created by you – users of the Avenview 4 x 1 HDMI Quad MultiViewer HDM-SPLITPRO-4A. User manuals are also available on the Avenview website under A/V Presentation - Signal Processing & Distribution - Multi Viewer Processors.